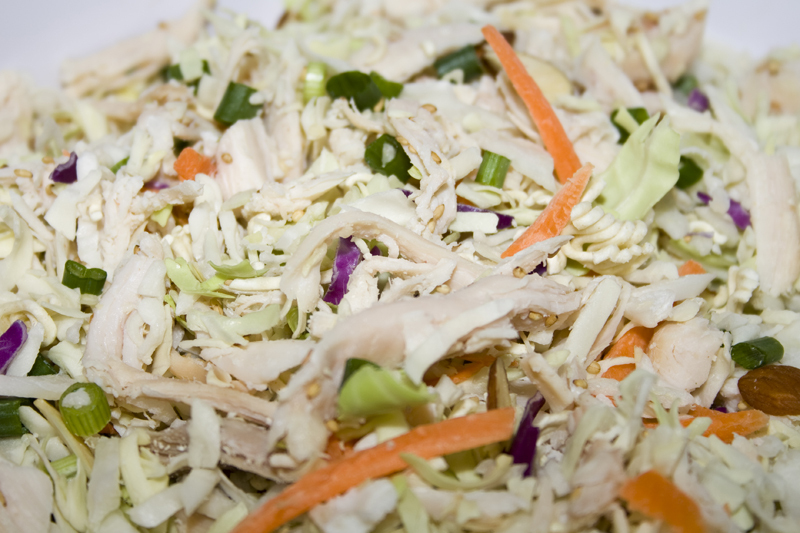 One of my all time favorite light meals is Chinese Chicken Salad. I always thought it was hard to make, until my friend Emily shared her recipe with me. Wow. So easy and scrumptious. I love it! Crunchy almonds mixed with a slightly sweet, slightly tangy sauce take a plain old bag of coleslaw mix to a whole new level. Rip apart a rotisserie chicken and toss it all together for an incredibly quick and easy delicious meal! I love to make this salad to take camping as well. 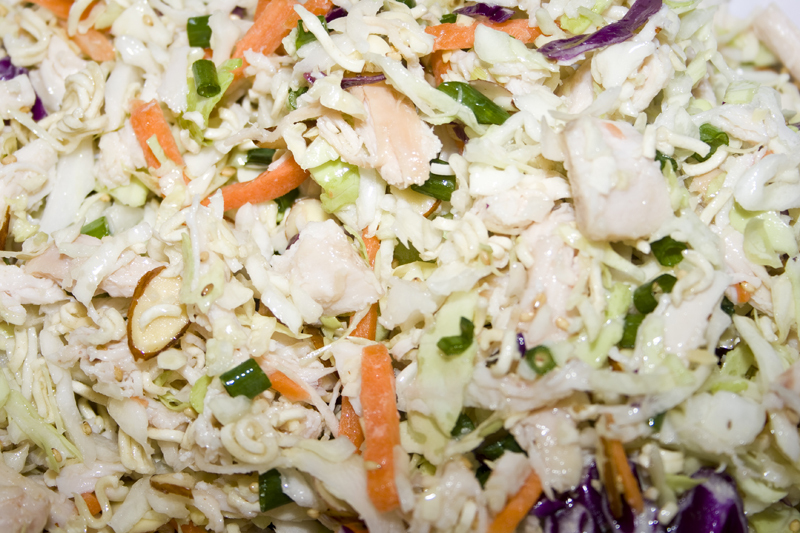 We take a big batch of this, throw it in the cooler and munch on it for lunch and dinner. Fantastic. 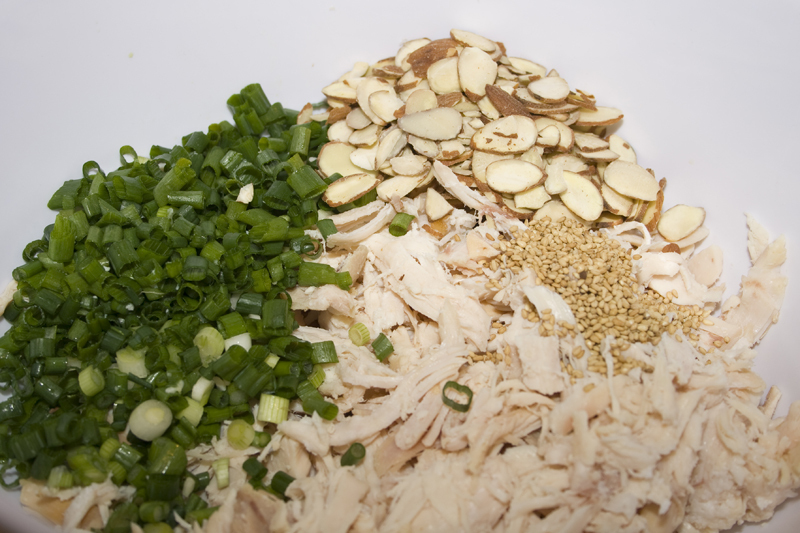 Chop a bunch of green onions and throw in a big bowl with 2 1/2 cups cooked chicken (I always just shred a rotisserie chicken), a handful of toasted sesame seeds and a 1/2 cup of almonds. 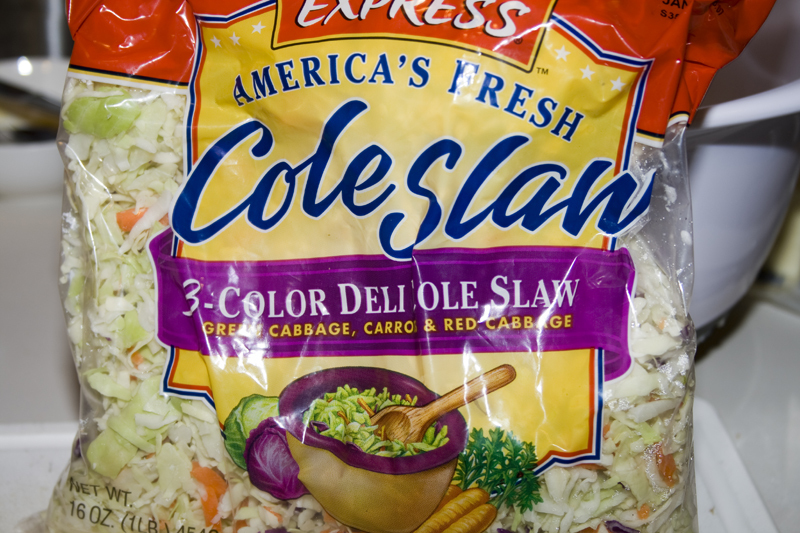 Add one bag of cole slaw mix (or a shredded head of green cabbage) and toss together. 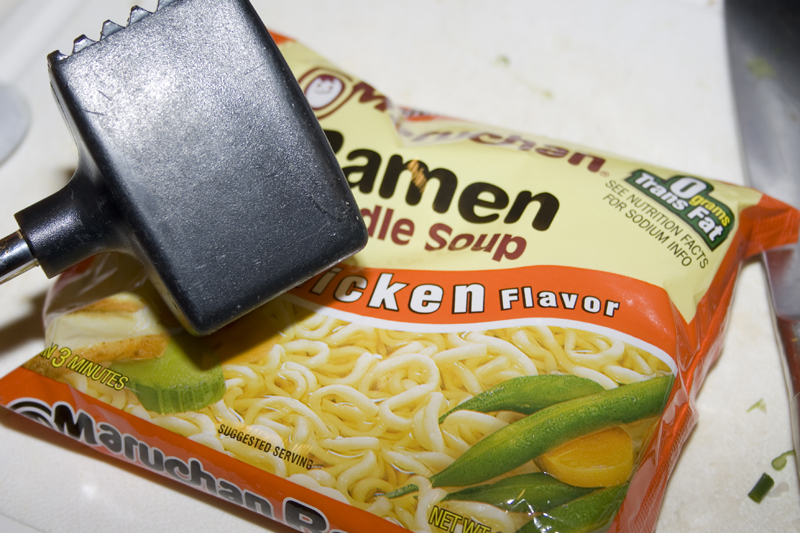 Take out some aggression by smashing a package of ramen with a hammah! Add to the salad bowl. Mix together the dressing ingredients and pour over the salad. Toss to combine. I usually put the dressing on a half hour before serving for dinner because I like it with a little bite left in the cabbage. If you are a fan of truly wilted salad, you can make this 12-24 hours before serving and it will be perfect. Mix all salad ingredients together in a large bowl. Combine the dressing ingredients until sugar has dissolved and pour over the salad ingredients. Toss to coat. Allow to set 30 minutes – 24 hours depending on how wilted/soft you want the cabbage. Made this for the Mother”s Day luncheon as well. Everyone loved this salad. I love how easy it was to prepare. I love love love this salad. It’s so simple and amazing. Glad you enjoyed it for Mom’s Day. Perfect occasion for it. It is incredibly good. One of my absolute favorite summer dinners. Or lunches. Sometimes breakfast.